The global BIPV glass market is experiencing a stellar growth due to the presence of several large and small players. Majority of the key players are focusing on new product strategies followed by product development and efficiency of BIPV technologies. The overall competition in the global BIPV market is likely to aggravate owing to the rising demand for BIPV glasses in commercial, industrial, and residential divisions. The global BIPV glass market has been observing a partnership between glass manufacturers and solar companies in the last few years. 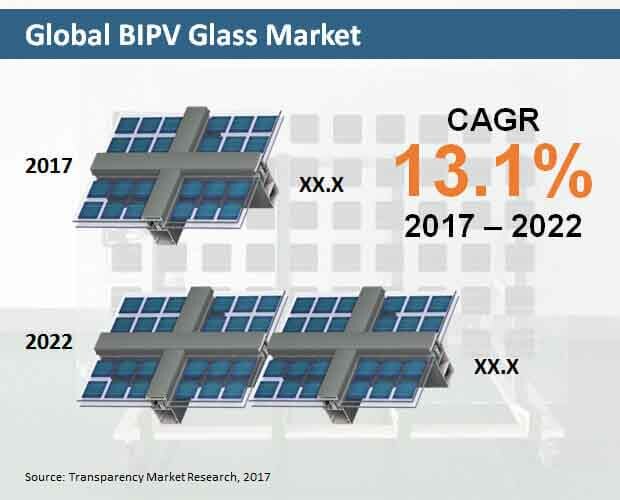 Also, it is expected that the BIPV glass market continues to establish alliances with several solar companies in order to expand their revenues. Few of the prominent market players in the global BIPV glass market include Nippon Sheet Glass Co., Solaria Corporation, Compagnie de Saint-Gobain SA, Canadian Solar Inc., Hanwha Chemical Corp, Trony Solar Holdings Co. Ltd., and E. I. DuPont de Nemours and Company. The global BIPV glass market is predicted to boost the demand with increasing investments in research and development activities of BIPV products and introducing new technologies during the forecast period 2017-2022. The global market for BIPV glass market is estimated to prosper at a robust CAGR of 13.1% in the forecast period. In 2017, the global market for BIPV glass was valued at US$1.78 bn and is estimated to surge and reach a valuation of US$3.3 bn by 2022. By material type, the global market for BIPV glass is segmented into Amorphous Silicon, Crystalline Silicon, Dye Sensitized Solar Cells (DSSC), and Organic Photovoltaic Cell (OPV). Of these, crystalline silicon is estimated to lead the global market in the forecast period. By region, the global BIPV glass market is divided into North America, Asia Pacific, Europe, and Middle East and Africa. Among these, Europe is anticipated to drive the demand of BIPV glass market from 2017-2022. It is expected to grow at a stellar CAGR of 14.8% in the forecast period. This growth is a resultant of new environmental-friendly guidelines that support the adoption of construction solutions and sustainable energy generation. In the meantime, North America and Asia Pacific excluding Japan are also estimated to offer fruitful growth opportunities to all the existing key players. This growth is primarily owing to the rising awareness on renewable energy and its advantages and robust industrialization. Both these factors are likely to have a positive influence on the global BIPV glass market. The demand for global BIPV glass market is primarily increasing due to the increasing awareness on the reduction of carbon footprint. The population in various regions has been shifting towards low-cost generation of electricity from renewable and conventional sources, which in turn, is impacting the BIPV glass market positively. The rapid adoption of green technologies is expected to surge the demand for BIPV glass market across regions especially in North America. In terms of sector, the construction segment is observing a huge market growth and contributes to the majority of share in global BIPV glass market. BIPV glasses are used in the construction of buildings such as educational, residential, hospitals, retail, and corporates. This will drive the demand of BIPV glass market. The architectural segment is also expected to grow due to the increasing investments in R&D.